Nathan Collins has been named as Skegness Town’s first-team manager, with Nick Chapman making a return to the dug-out. The Lilywhites announced the news, and new signing Tom Sawyer, this morning following the resignation of Martyn Bunce and assistant Terry Madigan on Monday night. Collins arrived at the Vertigo Stadium in November to work as joint boss alongside Bunce, and will now continue in the role alone. But he will be backed up by former boss and player Chapman, who led the club to three Lincs League titles in the space of four seasons. 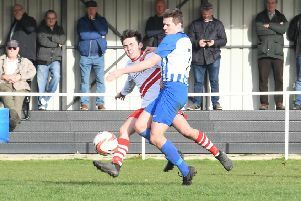 Chapman stepped down in the summer as the club moved into the Northern Counties East League Division One, citing family and work commitments. But he has decided to return to the dug-out. Town also confirmed that Arun Gray will remain as physio. Midfielder Sawyer, 20, was Grimsby Town’s reserve team skipper last season. Last night’s scheduled League Cup clash at Selby was postponed after falling foul of the weather conditions.